In the early days of the Compact Disc, all CDs (including Target CDs) were made in West Germany and Japan. Later, when pressing facilities became available in other countries, some Target CDs were also pressed in France and in the USA. Target CDs pressed in the USA generally use the same offset as their West German counterpart. Only the text at the bottom of the CD, stating that the CD was MADE IN USA BY PDO, and the absence of the GEMA-logo distinguish them from the West German pressing. These US pressings are quite rare and not easy to find. Today, on the 4th of July, I'm presenting a few of these USA-made Target CDs that I acquired in the past few months. The first one is Howard Jones's "Dream Into Action". The color scheme, purple target on a green background with silver lettering, is identical to that used on the West German pressing. There also exists a US pressing of the same CD with black in stead of silver lettering. Although the variation with black lettering seems to be more common, it is also very difficult to find. 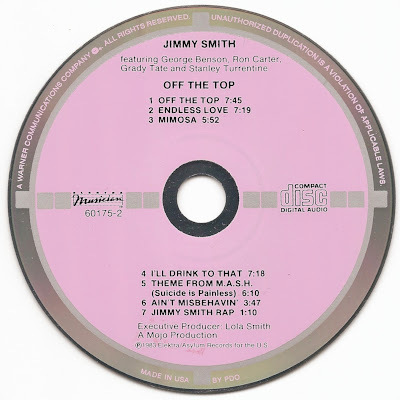 "Off the Top" by Jimmy Smith is the exception to the rule that the US pressing is based on the same offset used by the corresponding West German pressing. The character font used on the US pressing is different from that of the West German pressing and also the distance between the label and the catalog number (with an extra leading 9) at 9 o'clock is much larger on the West German pressing when compared to the US pressing. 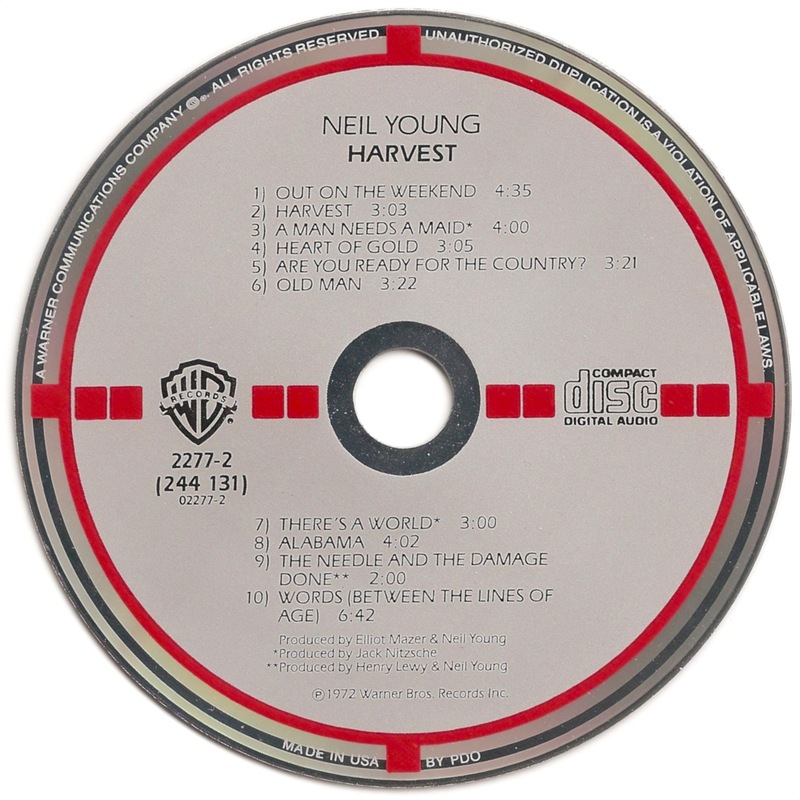 And finally there is "Harvest" by Neil Young. Somewhere else on this website I wrote that this was the first vinyl album I purchased almost forty years ago and that I replaced it with a West German Target CD when the first CDs were made available to the general public in the early 1980s. How could I know then that now, almost thirty years later, I would find myself possessing five different Target CD variations of this album, which I'm still considering as one of my favorites.